Madame Mustache, aka Madame Eleanor Dumont, aka Simone Jules was one of the early madams at Bannack, Montana. She was nick-named Madame Mustache, because of the hair on her upper lip. Beautiful and Unique describe this Madame Mustache Necklace. 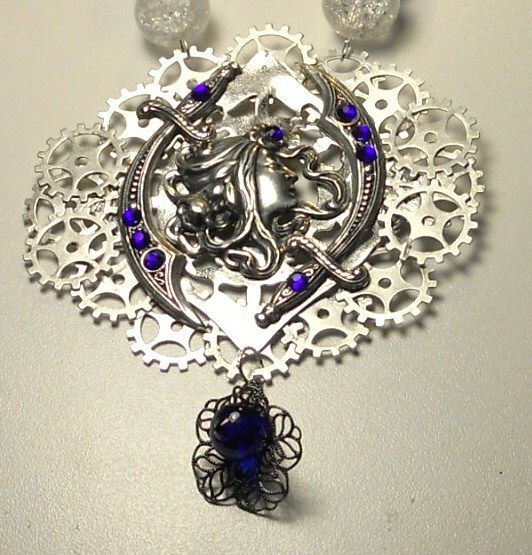 17.5″ long and made with Silver Findings, Cog Wheels, Flowing Hair Fairy Cameo, Sword Charms (the centerpiece is 4″x 3.5″), Lobsterclaw Clasp, Gunmetal Tulip Beadcab, 12mm Clear Crackle Glass Beads, Round 8mm Cobalt Blue Crystal Beads and Cobalt Swarvoski Crystals. 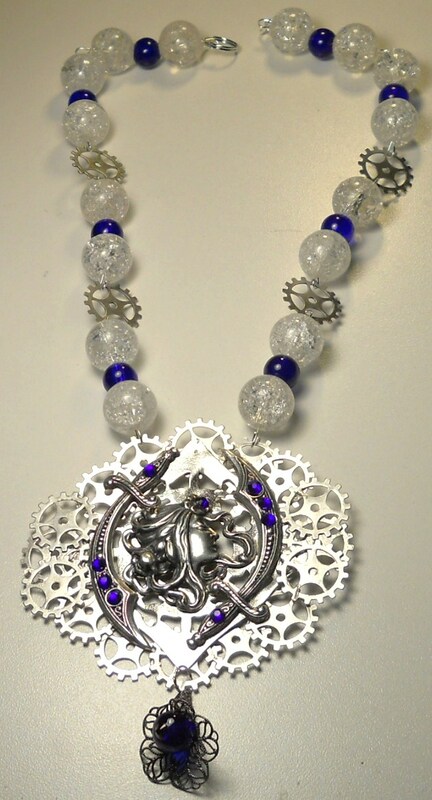 Another Designer Original from Jewels Designs Madame Steampunk Jewelry Line. If you’re looking for a piece that makes a bold statement then this is the piece for you! Check out this necklace and all of our other art pieces at Jewels designs.